Do other people describe you as a ‘pack rat’? Do your friends and family repeatedly comment on your inability to get rid of things, or show concern about the cluttered state of your office, home or car? Or perhaps you collect vast volumes of digital files on your computer beyond the point of usefulness, and feel incapable of deleting anything. If so, this article may help you clarify whether you have a pathological problem with hoarding. How to diagnose. Hoarding in the latest DSM-IV-TR appears only in the description of obsessive-compulsive personality disorder (OCD), and is not included in as an independent clinical disorder. Under the OCD differential diagnosis ‘hoarding’ should be diagnosed when it is categorically “extreme.” Therefore clinicians should diagnose “extreme” hoarding as OCD, and less than “extreme” hoarding may be a part of a different diagnosis, such as obsessive-compulsive personality disorder. 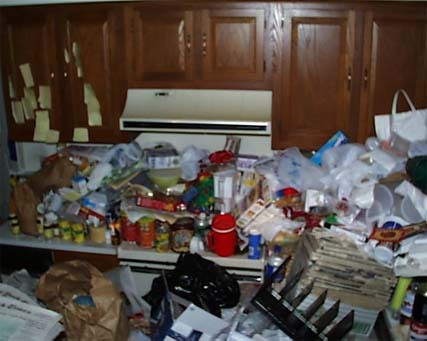 A primary anxiety in hoarders occurs when they are threatened by forced clearing of their possessions. They literally feel unable to discard their collections, regardless of the harm or dysfunction their behavior has caused. In its worst forms, compulsive hoarding can cause fires, unclean conditions (e.g. rat and roach infestations, injuries from tripping on clutter and other health and safety hazards, according to Sanjaya Saxena, MD, director of the Obsessive-Compulsive Disorders Program at the University of California, San Diego. The hoarder may mistakenly believe that the hoarded items are very valuable, or the hoarder may know that the accumulated items are useless, or may attach a strong personal value to items that they recognize would have little or no value to others. Levels of hoarding. Although not commonly used by clinical psychologists, criteria for five levels of hoarding have been set forth by the National Study Group on Chronic Disorganization (NSGCD) entitled the NGSCD Clutter Hoarding Scale. Using the perspective of a professional organizer, this scale distinguishes five levels of hoarding with Level I (Roman numeral one) being the least severe and Level V (Roman numeral 5) being the worst. Within each level there are four specific categories which define the severity of clutter and hoarding potential. Book hoarding. Bibliomania is an obsessive–compulsive disorder involving the collecting or hoarding of books to the point where social relations or health are damaged. One of several psychological disorders associated with books, bibliomania is characterized by the collecting of books which have no use to the collector nor any great intrinsic value to a more conventional book collector. The purchase of multiple copies of the same book and edition and the accumulation of books beyond possible capacity of use or enjoyment are frequent symptoms of bibliomania. Digital hoarding*. Digital hoarding involves collecting files on one’s computer beyond the point of usefulness. Often, files can be acquired through the Internet at no monetary cost, leading to extraordinarily large collections. Examples are music collections, often beyond what one enjoys or can listen to and television shows, movies and computer games. Hoarders, or “digital pack rats” often resort to buying optical media or new hard drives to store their collections, rather than deleting what they may never use. Digital hoarders find it just as difficult to press delete as traditional hoarders find throwing items in the trash can or taking things to the dump. They have the same feeling of clutter and chaos, and feel that they might find the item useful “someday,” and similarly spend large amounts of time acquiring and organizing their collections. However, unlike physical clutter, automated systems exist to organize digital clutter. Scientific American remarked that humanity’s propensity for data collection is growing at a rate faster than their ability to store it. *Digital hoarding is not a currently recognized subtype of compulsive hoarding by the DSM. Animal hoarding. Animal hoarding involves keeping larger than usual numbers of animals as pets without having the ability to properly house or care for them, while at the same time denying this inability. Compulsive animal hoarding can be characterized as a symptom of obsessive–compulsive disorder rather than deliberate cruelty towards animals. Hoarders are deeply attached to their pets and find it extremely difficult to let the pets go. They typically cannot comprehend that they are harming their pets by failing to provide them with proper care. Hoarders tend to believe that they provide the right amount of care for their pets. The American Society for the Prevention of Cruelty to Animals provides a “Hoarding Prevention Team,” which works with hoarders to help them attain a manageable and healthy number of pets. Animal hoarders display symptoms of delusional disorder in that they have a “belief system out of touch with reality”. Virtually all hoarders lack insight into the extent of deterioration in their habitations and the health of their animals, refusing to acknowledge that anything is wrong. Delusional disorder is an effective model in that it offers an explanation of hoarder’s apparent blindness to the realities of their situations. Another model that has been suggested to explain animal hoarding is attachment disorder, which is primarily caused by poor parent-child relationships during childhood. As a result, those suffering from attachment disorder may turn to possessions, such as animals, to fill their need for a loving relationship. Interviews with animal hoarders have revealed that often hoarders experienced domestic trauma in childhood, providing evidence for this model. Perhaps the strongest psychological model put forward to explain animal hoarding is obsessive–compulsive disorder (OCD). 2. Wikipedia, the free online encyclopedia. 4. Cumpulsive hoarding and the meaning of things, by Randy Frost & Gail Steketee, Houghton Mifflin Harcourt.